This shabby home decor is something I made while stuck in the house because of the ice and snow. I picked up this vintage tag, and a few others last time I was at the Canton Trade Day. I wish I had of bought a few more now. Oh well gives me an excuse to go back, if I needed one. But the hubby loves going as much as I do. I cut a piece of 2″ by 8″ about 10″ long, then gave it a quick sanding. Next I base coated the wood block with grey acrylic paint. Then I dry brushed a top coat of white acrylic paint. Letting some of the grey show through. Next I cut a piece of burlap a little bit larger than the vintage tag. 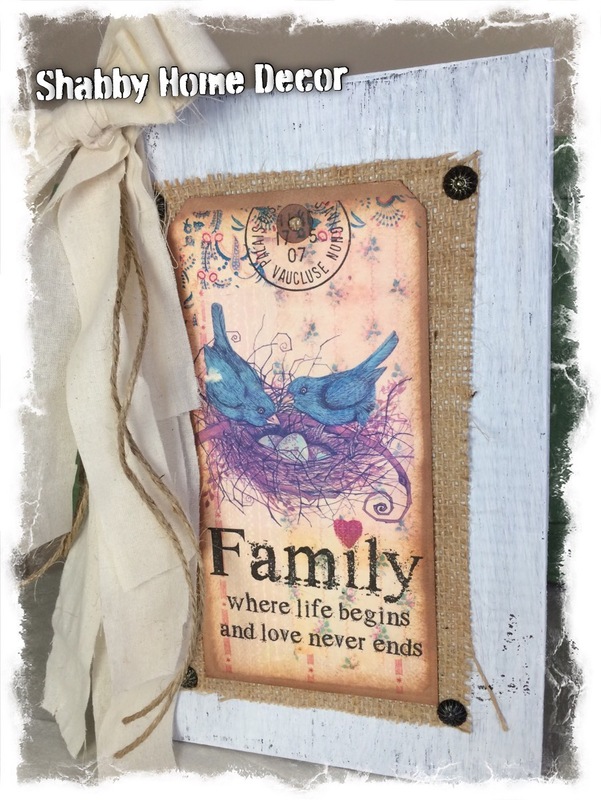 I used Mod Podge to glue the burlap to my wooden block. Then I added Mod Podge to the back of the vintage tag and centered it on my burlap. (I set something heavy ontop to hold it flat while it dried). While that was drying I made my shabby bow with muslin strips, and jute. Once burlap and vintage tag were dry I then added my decorative tacks to the corners of my burlap. Then I hot glued my bow on one side of the wooden block. And that’s it! Love the vintage tag, will have to buy more. 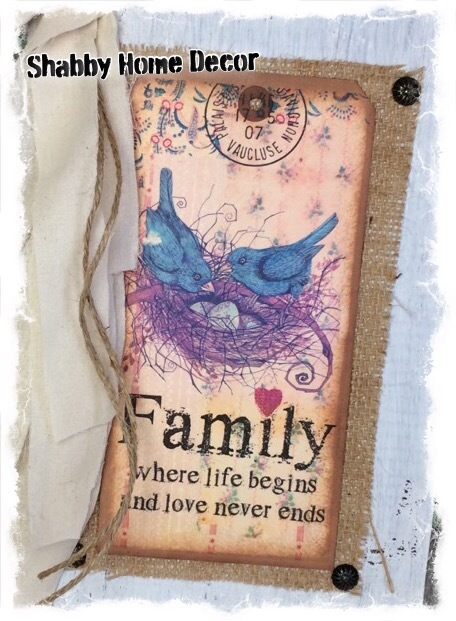 How do you like my shabby wooden block with the vintage tag? Oh, I love this tag! What a sweet deco piece, with the nest and the burlap. Thank you! I past it up the first time at the trade day, but made hubby help me find it again (-; Thanks for stopping by, hope you stop by again. Thank you Liisi! I bought this tag and a few others at canton’s first Monday. Thanks for stopping by! Thank you! Found this tag and a few other at the Canton Trade Days and couldn’t pass them up. this is super adorable! Love it. Than you for sharing it with us. Thanks Charlene! Yes it is a simple project. That is so beautiful, thanks for sharing. You have great talent and I love shabby chic! Looks brilliant, like it’s professionally made! 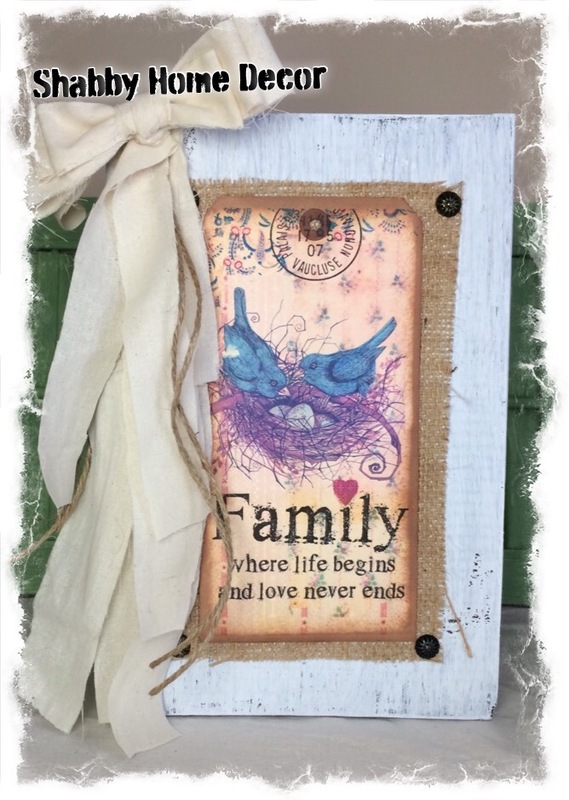 Love that saying about “family” and you sure did such a wonderful job with this – really pretty! Thank you Clare! I was holding onto the vintage tag for the right project. I love how it turned out. So cute how this turned out! I’ve never used burlap for my crafts. Is it easy to work with? Yes it’s really easy and there is so much you can do with it. Thanks Mandi! I am the same way. Use to not like burlap, but now love anything. Very fun decor. Thanks for sharing! Thanks Charlene! It was a fun and easy project. This looks awesome! Such a great job. Thanks for sharing how you made it too.